The Fordham University Rams Women’s Soccer Residential Prospect ID Camp will cover both technical and tactical sessions. There will also be competitive matches that will allow the players to showcase their outstanding soccer skills. This identification camp is intended for 13 to 18 years old high school girls who aim at refining their skills to compete at the college level. In addition, this soccer camp is going to run from the 20th of July until the 22nd of July. It will take place at the state of the art Jack Coffey Field which is on the Fordham University campus. Moreover, this residential soccer camp is an initiative of the Fordham Rams women’s soccer coaching staff. Fordham University, originally St. John’s College, is a private, coeducational, research university in New York City, New York. It is an affiliation of the Roman Catholic Society of Jesus (Jesuit) religious congregation and the Association of Catholic Colleges and Universities (ACCU). The university is also a member of the National Association of Independent Colleges and Universities (NAICU) and the Association of Jesuit Colleges and Universities (AJCU). Furthermore, Fordham University is applying a semester-based academic calendar. Its current undergraduate student population is 9,258 with a 43 percent male and 57 percent female students gender distribution. The university is also serving 6,324 postgraduate students. The university is also serving around 6,300 postgraduate students. Fordham University is among the nation’s top academic institutions. As a matter of fact, it is 132nd in the Forbes Magazine’s List of America’s Best Colleges. The university is also 61st in National Universities of the 2018 edition of the US News and World Reports Best Colleges rankings. In sports, the university features 21 college athletic teams in the National Collegiate Athletic Association (NCAA) Division I, Atlantic 10 Conference. They are the Rams and their identity colors are maroon and white. Jessica Clinton, a native of Valley Stream, New York is the head coach of the Fordham University Rams women’s soccer team. She is now in her fifth season at the reins of the Rams women’s soccer program. Coach Jessica Clinton is a bachelor’s degree in hospitality administration graduate from Boston University. Additionally, Coach Clinton is a United States Soccer Federation (USSF) “B” and “C” coaching license holder. She is also a National Soccer Coaches Association of America (NSCAA) National Diploma and Advanced Diploma holder. In just four years, Coach Jessica Clinton has already led the Rams to three Atlantic 10 Championship games. Then, the Fordham University Rams women’s soccer assistant coaches are Shannon Neely Noel and Ally White. Coach Shannon Neely Noel, a native of Dublin, Ohio is now in her second season with the coaching staff. She is a double-major in art and industrial design graduate from Ohio State University and a master’s degree in education graduate from Grand Valley State University. She is also an NSCAA Goalkeeping Diploma and NSCAA Advanced National License holder. Similarly, Coach Ally White is also in her second season with the Rams coaching staff. She is a Fordham University graduate with National F and E licenses. Coach Ally White is also an NSCAA Level 6 coaching license holder. 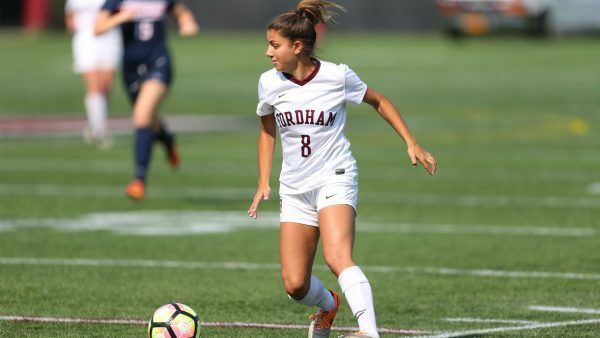 The Fordham University Rams Women's Soccer Residential Prospect ID Camp is especially for 13 to 18 years old prospective college soccer female players. It is the ideal venue to experience a real collegiate-level training and playing environment. This soccer identification camp is under the direction of the Fordham Rams women's soccer coaching staff.